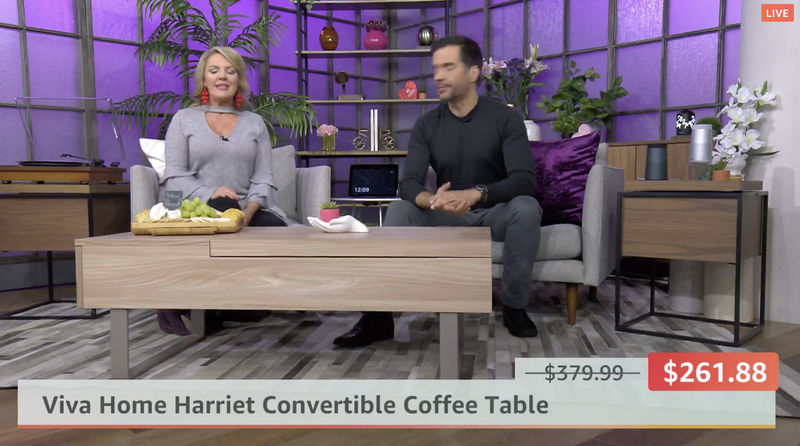 Amazon has already proven itself to be a forced to be reckoned with in the world of streaming entertainment — but its “Amazon Live” live shopping stream seems a bit lost and notably doesn’t try to take advantage of any of the graphical mainstays of home shopping TV networks. Viewers can tune in to the “Amazon Live” programming stream on computers, mobile devices and compatible smart TVs. There’s a constant “live” stream that appears to mix live and taped content, as well as archived video streams. 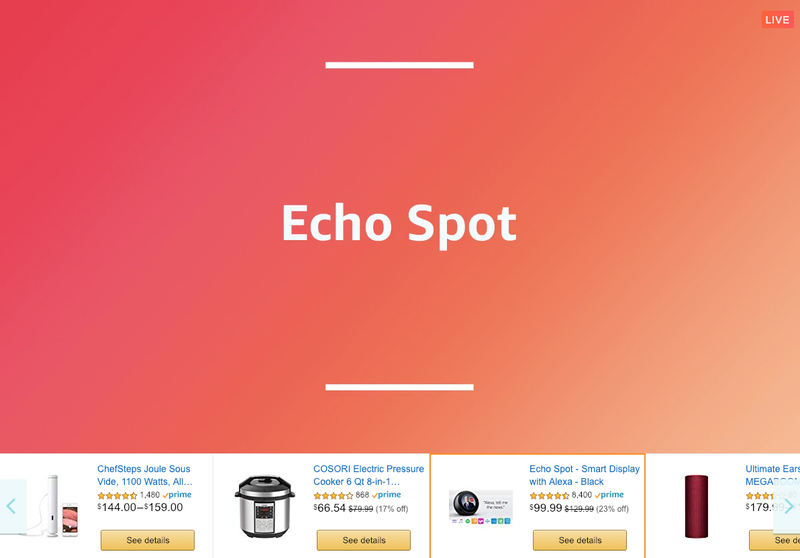 A large, video panel dominates the screen real estate, with a horizontal “rundown” of products below with familiar Amazon yellow buttons next to each one that take shoppers to a product page for more information. 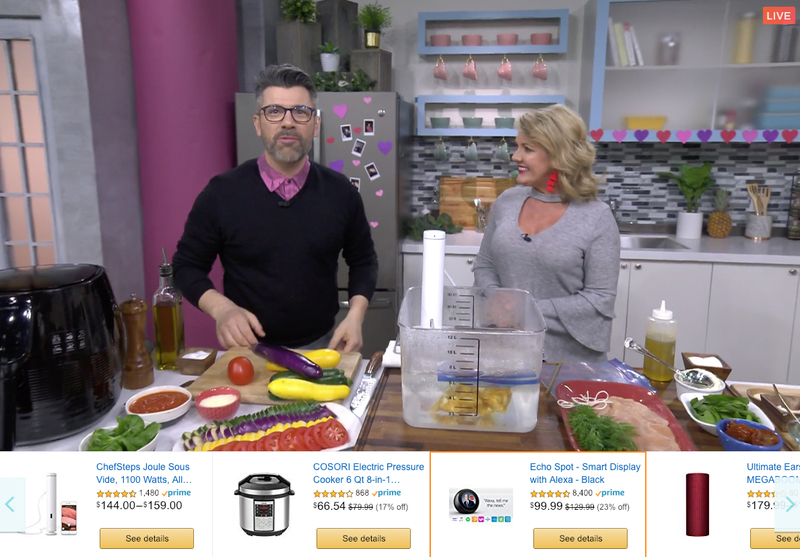 In addition to helming its own product sales presentations, Amazon Live is also trying to encourage brands to create and stream or tape “infomercial” style content through what it calls the Amazon Live Creator app. To participate, your company needs to be an approved Amazon Brand Registry and contact the company to next steps. When Amazon products are hawked on Amazon Live, an orange and coral gradient background with the company’s trademark font are used to create full screen graphics with the product name. Other products also typically run at the bottom of the screen. 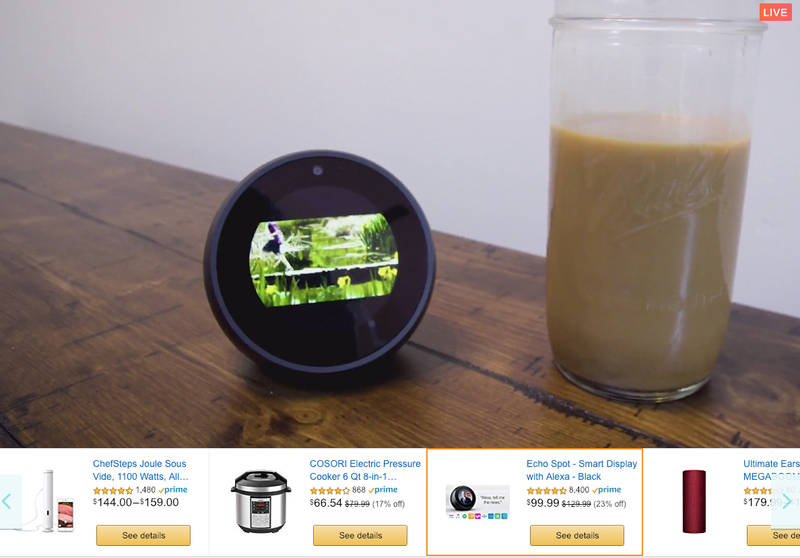 In this show, the Amazon produced content shows the Amazon Echo Spot next to a rather unappetizing beverage of some kind. The “live” bug remains on screen during most programming, even this segment, which was obviously pre-recorded given its quick cut editing style. 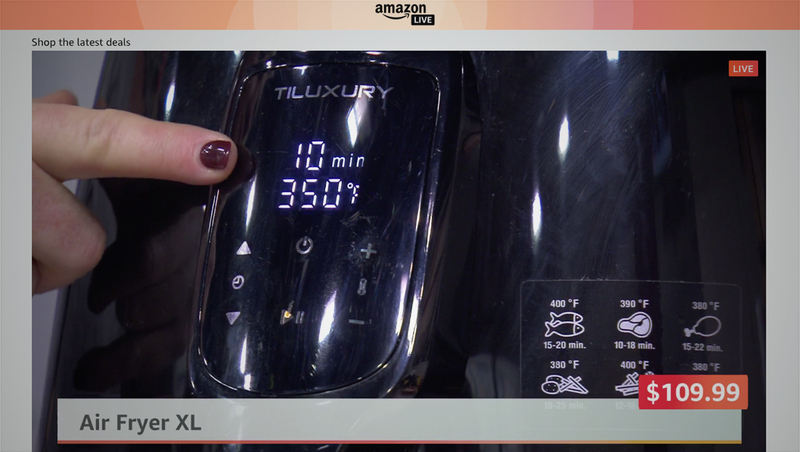 Amazon also has its own ‘Amazon Kitchen’ that lets it show off cooking gear — much like HSN and QVC. Amazon-produced segments include these lower thirds in a transparent gray with the orange-coral accent. as lower-third style graphics. The kitchen set has blue and violet accents. 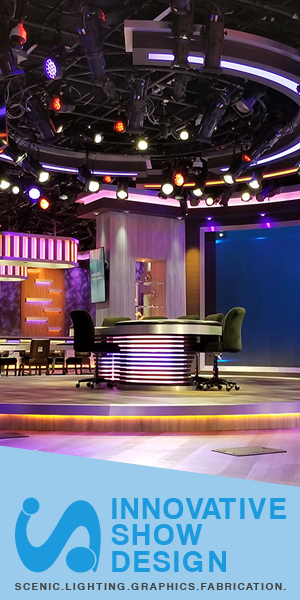 Amazon also has a living room-style set with loft-style windows backlit in violet. In this brand produced segment, the company opted to include an L-bar with a ‘rundown’ going down the left side and a scrolling ticker of its Amazon reviews. During branded segments, products shown below the video window are limited to the ones the brand is spotlighting. It’s worth noting that Amazon Live is missing much of the graphical look that has become a mainstay of TV shopping. There’s no “countdown” or inventory remaining counter that create a sense of urgency that are all but ubiquitous home shopping TV networks — and have been copied by ecommerce sites. Granted live web streams in this format are a much different animal — and not all these features would be practical given how Amazon Live works. 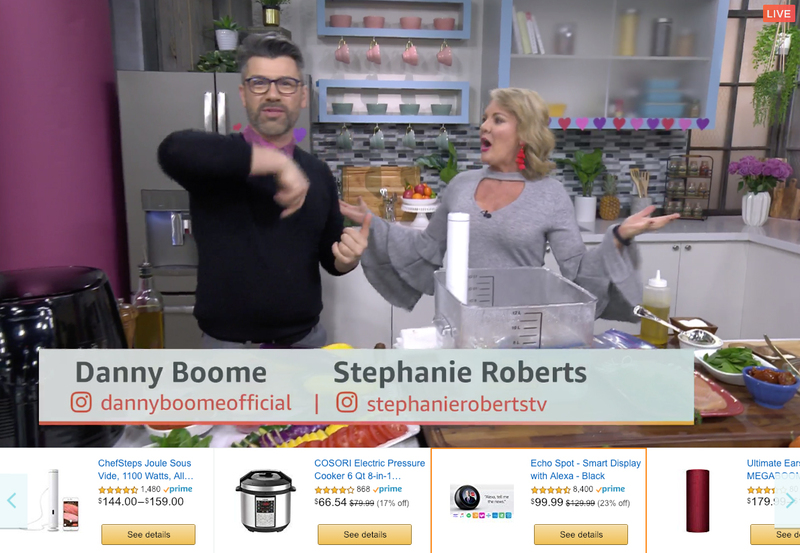 Other elements of Amazon Live do conjure feelings of QVC and HSN — the sometimes stilted or overly enthusiastic presenters and demonstration-style format. And there’s the painful-to-watch-yet-somehow-fascinating infomercial like format that many of the video segments take on. 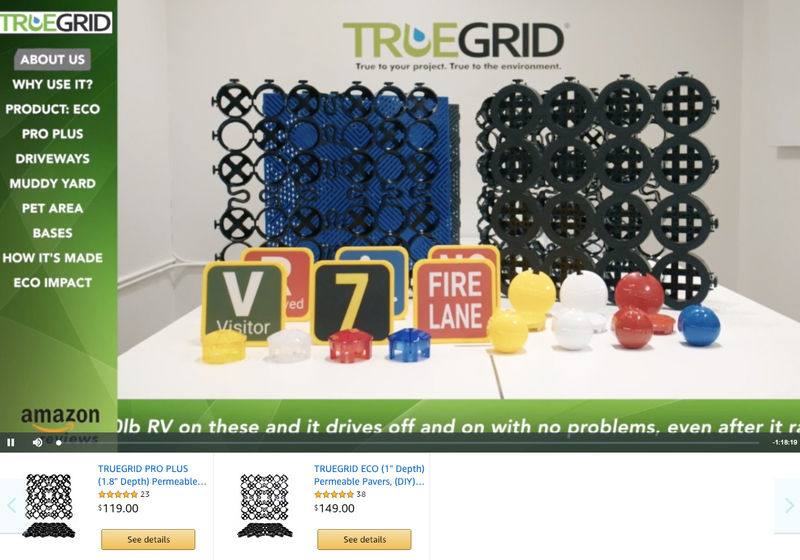 Of course, Amazon Live is only in its infancy, so who knows what other features Amazon could add given its ecommerce technology and customer data to take the home shopping network idea to whole new level.